Some parents are fortunate to have a child with an easy temperament, who is eager to please, making discipline easy. These parents might not even need to learn effective discipline techniques, because their child is so compliant, that even ineffective discipline works. Parents of a difficult or strong-willed child don't have this luxury. Their children will often argue about everything and test their parents repeatedly, making discipline and daily life hard on all members of the family. I often see parents who 'don't know what else to do' with their child. They may even feel like that they have 'tried everything.' Time out doesn't work, because he 'tears up his room.' Taking away privileges doesn't work, because 'there is nothing left that he wants or cares about.' And most attempts at discipline turn into arguments or fighting matches. At this point, parents either figure that they are doing something wrong, which they can't understand, especially if they have another child that behaves well, or they take it personally and think that their child is 'doing it on purpose.' Usually, neither is true. Other parents continue with the same routines and daily arguments, hoping that the behavior is just part of a 'terrible-twos' type stage or phase that the child is going through. Unfortunately, bad behaviors usually don't go away on their own and are not outgrown. While it doesn't mean that you are a bad parent or that you don't know enough about proper discipline if your child misbehaves, if what you are doing isn't working, then it is time to get some help and try something different. Why are strong-willed children hard to discipline? Dr. MacKenzie explains that it often has to do with your child's temperament, which in the case of a strong-willed child, can make them 'require a lot of guidance and discipline,' because they often 'learn differently' and 'need to experience the consequences of their own choices and behavior.' Also, because regular discipline methods don't usually work with these children, they can bring out very strong reactions in parents and their behavior can be hard to understand. Once you understand your child's temperament, it can make it easier to understand why your discipline techniques aren't working and why he repeatedly needs to 'test' you. It can also help to understand your own temperament and how your child's and your own temperament fit together. A 'bad match' between temperaments can make discipline even harder. While you can't change your child's temperament, Dr. MacKenzie shows how you can change your own (so that you don't take your child's behavior problems personally) and how you can learn better 'guidance methods' to make it easier to raise your strong-willed child. How come your child defies or challenges your rules or just ignores them? It is often because he is trying to test your rules, by 'doing research', to see what he can get away with and what works for him. If ignoring the rule lets him get out of doing something that he doesn't want to do, whether it is cleaning up his room or turning the television off, then he is unlikely to listen. Even if he only delays doing something for 5 or 10 minutes or if you give in half the time and let him out of doing it, that is usually enough to reinforce his being defiant. By learning how to better teach your rules, and avoiding methods that are 'permissive' or 'punitive,' you can help your child respect your rules. Dr. MacKenzie teaches that the best method of teaching your rules uses a 'democratic approach,' which includes a 'balance between firmness and respect'. By learning to set firm limits, and avoiding soft limits, your child will learn that he is expected to be compliant with your rules and he should test them less often. What happens when you try to discipline your child? If he is strong willed and you are using ineffective limits, then you are likely stuck in a pattern which leads to shouting, fighting, arguing and little compliance. Dr. MacKenzie describes these as a 'family dance,' which he describes as the 'destructive patterns of communication and problem solving that are passed on from generation to generation.' Family dances often include too much talking ('verbal steps') until you reach your 'action step' (such as time-out). Recognizing if you are in such a pattern can help you to get out and avoid the 'negative attention,' 'reinforcement' and 'live entertainment' that they provide for your child. Other tools include a cool down period, offering limited choices, using a timer and not taking your child's bait and being drawn into arguments or discussions. Types of consequences include natural consequences, which 'follow naturally from an event or situation,' such as if he breaks a toy, then he doesn't get to play with it anymore. You can also use logical consequences, which are 'logically related to the situation or behavior,' such as not being able to ride his bike if he is caught riding without a helmet. Dr. MacKenzie describes many different situations where these types of consequences can be effective, including when a child is forgetful, careless, procrastinates, doesn't cooperate with other kids, doesn't share, makes a mess, doesn't do chores or homework, or is destructive. The last few chapters teach how to motivate and teach your strong-willed child to cooperate and follow your rules by avoiding negative messages, and instead, using positive messages, exploring choices, and role-modeling corrective behavior. Ideally, parents should read Setting Limits with your Strong-Willed Child before they begin to have discipline problems so that they can avoid getting into a 'family dance.' If you are already there, or just need a little help teaching your child to respect and cooperate with your rules and limits, then this book is for you. In addition to describing in detail each of the techniques that lead to effective discipline mentioned above, Dr. MacKenzie provides clear guidelines of how to use each technique. This includes numerous examples of what not to do and situations in which each method would be most effective. 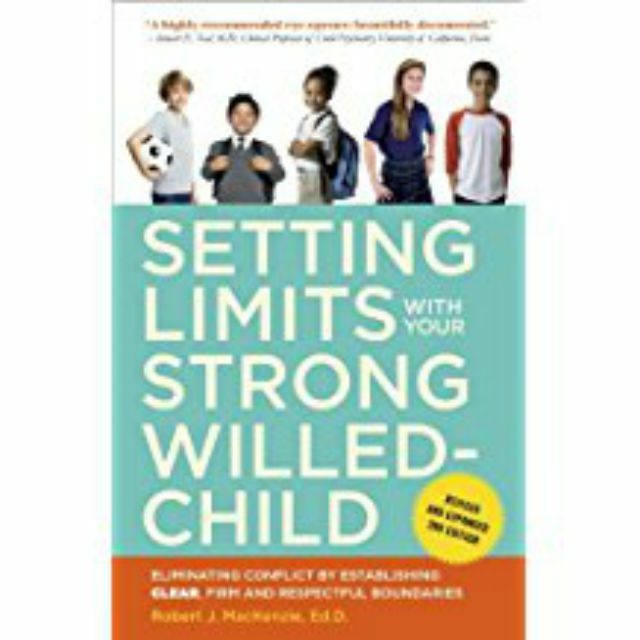 Setting Limits is also easy to read and well organized and I highly recommended to all parents, especially if you have a strong-willed or difficult child.